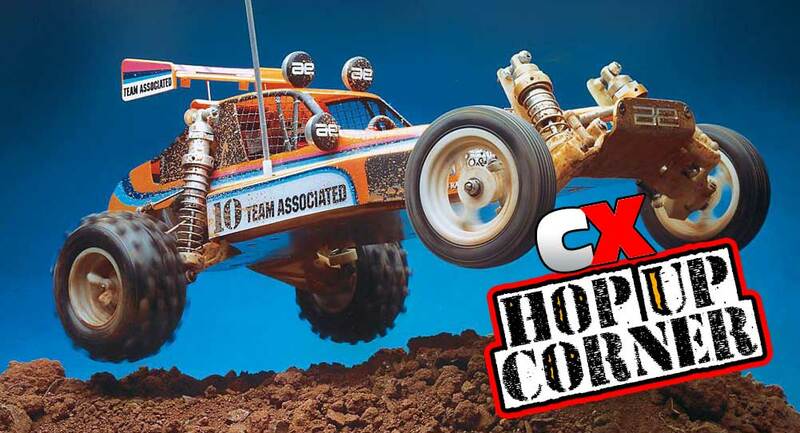 For this installment of Hop Up Corner, we’re going to check out some of the best upgrades for your Team Associated RC10 Classic. 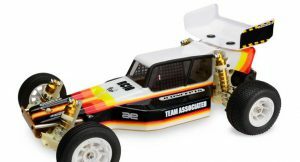 This iconic 2WD buggy is still available as the Classic version, however, they are easy to find as new or used from various sources. We are going to highlight some of the great hop up parts that are still available for this famous buggy. 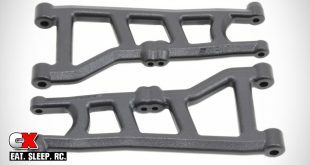 One of the more popular hop up parts when the original RC10 was in production was suspension arms. There were a number of companies making aftermarket A-arms, one such company being RPM R/C Products. RPM’s arms were popular because they were lighter and more durable than the stock AE part. RPM has re-released their Front A-arms and Rear A-arms, much to the delight of current RC10 and RC10 Classic owners. They are molded in black using a strong nylon blend. 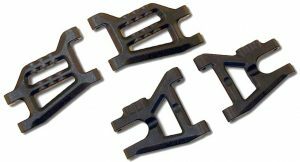 RC10 Classic owners may also need to replace the inside rear hinge pins because of a change to the stock width from the original RC10 design. 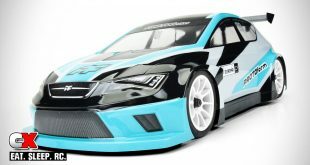 Keep in mind they will not work on newer models such as the B2, B3, etc, and will not fit the RC10 Team Car kit. 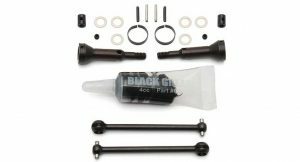 You can pick up the arms and hinge pins for around $27, which is a reasonable cost to reduce the weight and strengthen the suspension on your RC10. 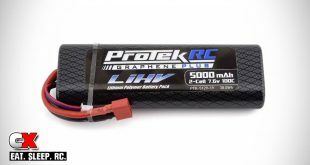 Unless you are restoring an RC10 and want a period correct ESC and brushed motor, you have a lot of options for the electronics in your RC10. 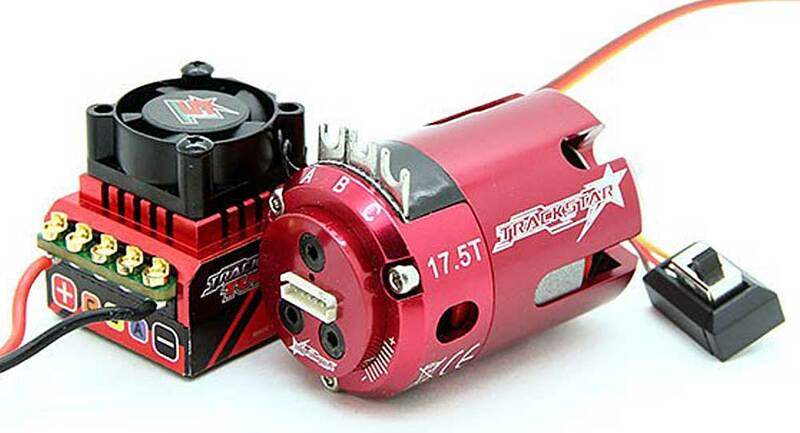 The perfect choice for a modern ESC/motor combo is the TrackStar ROAR approved 1/10th Stock Class Brushless ESC and 17.5T Motor Combo from HobbyKing. I run this combo in my vintage RC10 and really like it. It is a very budget friendly selection at under $90 and gives plenty of power with smooth throttle response. The ESC features an alloy case top with a heatsink for the Mosfets and a strong cooling fan. It also features terminal cups for both the battery input and ESC output cables. The excellent ESC software has a large number of user programmable settings including punch, initial brake, drag brake, boost timing RPM, boost timing, Turbo timing, Turbo delay, Turbo ramp and boost acceleration. This really allows you to customize the performance of your ESC. I highly recommend getting the programming box as well; it really makes programming the ESC a snap. I like this combo so much, I run it in my RC10B6 as well. The drivetrain of the RC10 was already pretty stout. In its stock configuration, the drivetrain uses metal dog bones to transfer the power from the transmission to the rear wheels. There are a number of problems inherent to a dog bone setup. Dog bones tend to have some play in them until they engage the cup. When you hit or let off the throttle, there will be some slop until they engage the cup again. Another issue is the dog bone pins and the cups will begin to wear over time. CVDs, on the other hand, are more efficient and tend to last longer than dog bones. CVD stands for Constant Velocity Drive and are always in contact with the pivoting parts. There is no slop and they are stronger, smoother and much more efficient than dog bones. Another benefit of the CVD is the fact they will not pop out and get lost if a ball cup pops off the rear suspension. 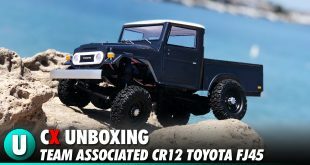 Team Associated still makes CVDs for the RC10. The set retails for $30 which isn’t cheap, but you’ll find it a very good investment. While the RC10 kit comes with a very good body, there is one available that will set your buggy apart from the others. The JConcepts Detonator is a very unique body. It harkens back to the past before cab forward bodies existed. The Detonator is still biased to the rear, but it sports a very large cab with big windows. There is a lot of detail to the cab, as it has molded window pillars and driver netting. The cab extends over the rear shock tower and provides a very aerodynamic flow with a little kick-up on the tail of the body. The side pods hug the classic aluminum tub chassis while still leaving room for today’s modern electronics. The large, 5.5” hi-clearance wing is designed to sit tight to the body for improved air flow. The wing, in combination with the rear kick up, provides excellent rear downforce. The wheels and tires that come with the RC10 were good back in the day, but today’s tire technology is vastly superior. While there are conversions to allow you to mount modern sized wheels and tires, I prefer the original, period correct size. JConcepts has the perfect set of wheels and tires to give your buggy excellent grip, while looking old school. 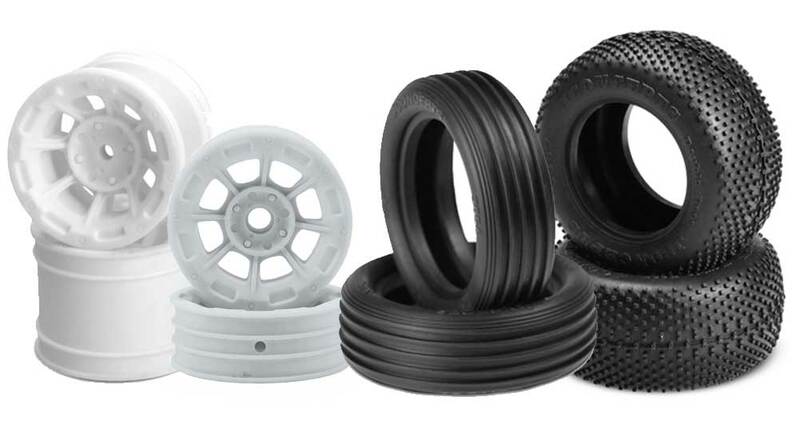 For wheels, you can’t go wrong with Hazard – 1.9″ RC10 front wheels and Hazard – 1.7″ RC10 rear wheels. They are very sharp looking and go great with the tires that JConcepts makes specially to fit them. JConcepts Double Dees rear tires are one of the more popular tires around and are available in various sizes and applications. Luckily, JConcepts decided to make them to fit the Hazard rear wheels, allowing RC10 owners to enjoy their benefits. The green (Super Soft) compound tires come with And-1 open-cell inserts for increased support. The full sidewall and round profile tire provide excellent performance on old-school, low grip tracks. To fit the front Hazard wheels, there are the JConcepts Rips – 1.9” RC10 tires to complete the authentic vintage look. Like the Double Dees, the ribbed-style Rips Super Soft compound is excellent for racing on those old-school type tracks. Of course, they’ll have great performance on tracks with more grip. In my opinion, one of the most critical hop ups you can perform on the RC10 is to replace the stock steering assembly, or bellcrank. 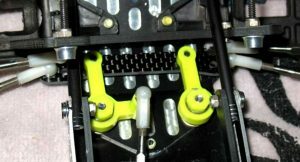 The bellcrank is the assembly that connects the steering servo to the steering blocks so that when you turn the steering wheel on the transmitter, it turns the buggy left or right. The stock bellcrank is plastic and pivots on two screws in the chassis. After a while, the steering assembly tends to develop a lot of slop. To combat that, a number of companies offer different aftermarket bellcranks. There are still options available today, including one of the original offerings – Allec and Lane‘s Associated RC10 Ball Bearing Bell Crank Steering. Unlike the stock plastic one, A&L’s unit is made from a tough nylon-type material with a graphite center link and rides on 1/4” x3/8” flanged ball bearings. A&L recently re-released the bellcrank steering assembly along with other vintage parts for other type of vehicles. With the A&L setup, your steering will extremely smooth and bulletproof. The RC10 and RC10 Classic was an amazing buggy in its day. With the hop up parts that are still available today, you can make this buggy even better. Once you’ve made your upgrades, send over some pictures and we’ll get them posted on the CompetitionX Facebook page! man this is some great stuff ! i have three RC 10 classics that i have modified .i love them. Love mine as well. Just don’t drive it as much as I’d like to.